iPad – Trojan Horse ? The media hype generated by the launch of the Apple Inc. iPad has been seriously irritating me over the last weeks. Apart from the fact that I can not see anything revolutionary about either the hardware nor the software, I can see a number of highly problematic developments with the way Apple is trying to create a total vendor lock-in. However – the single biggest issue is not actually the device (iPad) itself, it is actually it’s lock to Apple’s iTunes Store. There will be no (at least for the ‘normal’ end-user) way to install software or load content onto the device other than going through iTunes. The device seems to have been deliberately crippled (not even a USB connection) of any way to get content on or off it other than Apple’s mandated iTunes. The resulting vendor lock-in from both the hardware (Apple only devices), Software (all Software that will install on the device will have to go through iTunes) as well as increasingly Content (purchased via iTunes Store) is a very worrying trend from my point of view. Return of the dinosaurs ? One possible reason for the hype generated for the iPad seems a vested interest on behalf of the media industry in the ability to lock down content and create a paid digital market for their content. It’s about creating a walled garden where previously was a free and open Internet. It seems that the old media conglomerates are looking towards iTunes as a possible extension (saviour) of their failing business models. Television 2.0 – the new rise of new media consumerism ? No iTunes – no education ? One of the most problematic areas for me is the use of the iPad as the primary computing device used in Education. There seem to be a number of educational institutions planning to replace printed lecture materials with iPads even before the release of the device. While I don’t see any issues with the replacement of printed material, the replacement with one single proprietary & closed system seems an extremely bad choice on a number of fronts. There are plenty of approaches already in the public domain (from the use of Open eBook standards to complete Open Education Resources in a variety of formats) that can be accessed from an iPad as well as any other (tablet or other) device with a decent web-browser or similar retrieval mechanism (RSS, …). As stated on the beginning of this blog entry I don’t have an issue with the iPad as a hardware device (and I haven’t actually used one yet – due to the fact they will not be available in Australia for a while). But from all the technical details available the combination of a locked device with a locked store and locked content seems a bad idea all around from my perspective. 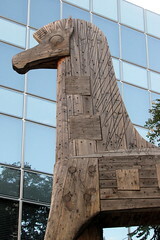 Author Leo GagglPosted on April 10, 2010 April 26, 2010 Categories education, mobileTags ipad, itunes, locked, proprietary, vendor lock-inLeave a comment on iPad – Trojan Horse ?